The Wicks should be camping in Acadia this week. Because of a looming storm-front hanging over New England, we decided that staying at my folks’ place on the Jersey shore sounded way more relaxing than sitting in our tent with our loveable but smelly dog. So we find ourselves in Margate City, NJ. If you have never been to the Jersey shore, this is a sleepy little town on the southern end of the shore with beautiful beaches and a suburban vacation feel. I’ve never seen “Jersey Shore,” but I can assure you that this town is far from that nonsense. Whoever Snooki is, I’m sure she has no interest in visiting this place. So this is a hot dog blog and it has just occurred to me that I have yet to mention eating any dogs. We did eat some, I swear! My parent’s house is right by the bay and we have passed “Junior’s Doughnuts & Dogs” several times before this particular trip. Today we decided to take the plunge, and the whole Wick gang, dog and all, stopped in for lunch. Hot dog bloggers on vacation should at least sample the local wares, after all. Mike and I have been talking about the need for reviewing a corn dog for some time now. When I saw the corn dogs prominently displayed on the menu board, I knew that it was now or never. Fried food? delicious! Hot dogs? Delicious! Fried dough wrapped around a hot dog? It seemed so wrong. But when the sausage-shaped fried lollipops came out to the table, I knew it was going to be good. It looked like summer on a stick. When do adults ever get to eat like this but at the beach? I felt giddy just ordering them. That feeling of nostalgia washed over me…days on the beach, nights walking down the boardwalk eating salt water taffy and gorging ourselves on funnel cake or corn dogs…….I may live in New England now, but I am a Jersey girl, after all. 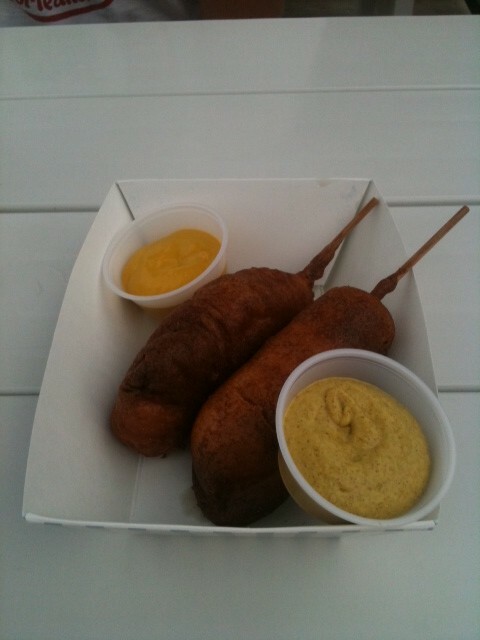 Each order came with two corn dogs and a choice of ketchup or mustard. 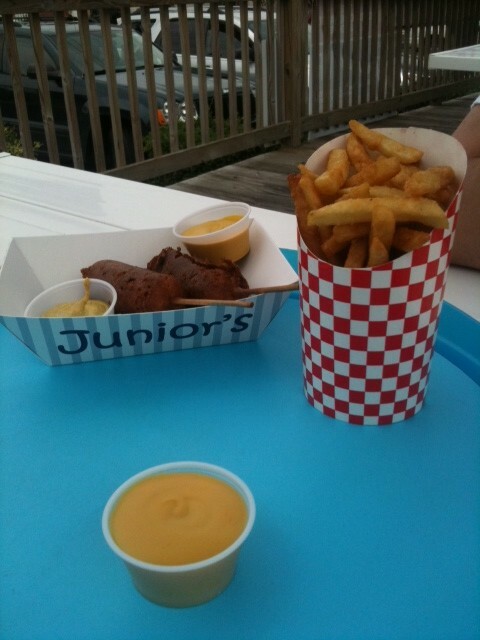 We were happily surprised to see two dipping mustards on our tray – one yellow, one spicy brown. After sampling both, I actually realized I liked the corn dog solo. Without the mustard I could really taste the dog. It was beefy and juicy and it melded with the sweet batter so nicely as it disappeared in my mouth. The dog itself was an all-beef hot dog. To be honest, the dog itself was nothing special. However, when you dip that ordinary dog into cornmeal batter and fry it up, it was pretty darn good. It was sweet and crispy and greasy. All the evil and delicious qualities that make food yummy. Especially on the beach. Simi should be a regular contributor. 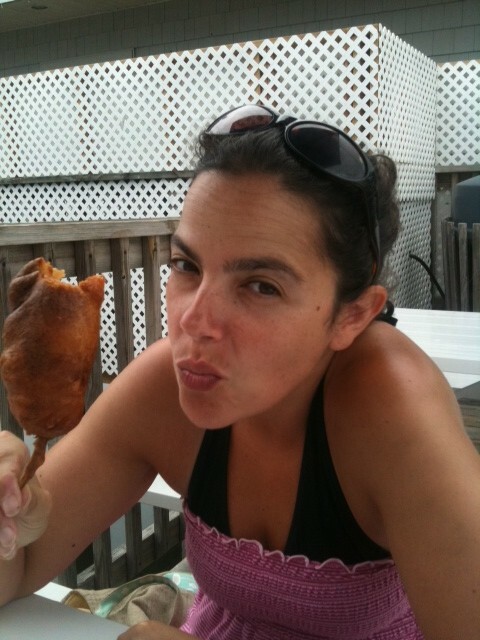 We’ll have to try the corn dogs next time we’re down at the Jersey shore.